As a mining town Cullinan has become world famous. It is located a mere 20 minutes by road from the city of Pretoria, near Johannesburg in the province of Gauteng, South Africa. Cullinan’s Premier Diamond Mine, once owned by Sir Thomas Cullinan, is best known for the discovery of the Cullinan Diamond. It is estimated that a quarter of the world’s large diamonds have been unearthed at the mine. In addition, Cullinan is an important source of highly sought after rare blue diamonds. The huge Cullinan Diamond was discovered in 1905 and a large blue diamond was discovered in 2008. The town of Cullinan is quaint, historic and a real treat for any history enthusiast. It is literally a living museum. Old mine manager’s homes have been restored to their original grandeur, and converted into bed and breakfast inns, preserving their turn of the century charm. A very unique adventure activity is the underground mine tour. Cullinan is a working mine and tours are offered for small groups to join a mine guide underground. A surface tour includes a visit to the big hole. Tours must be booked at least 2 weeks in advance. Tours start very early with orientation. Arrive promptly at 7:30am. Your descent will start at 9am and you will be returned to the surface at 12pm. You will be fitted with special safety gear. Changing rooms are provided. You may purchase your overalls after the tour as a souvenir. In the lamp room you are fitted with Sizamoya self rescue pack. The guide will demonstrate how to use them. Visitors who are asthmatic or claustrophobic should not take the tour. You will descend to a level of 763 m (2,500 feet) below the big hole. Anyone under the age of 16 is not permitted on the tour. Watch this very informative video on Cullinan to get a real ‘feel’ of a piece of South African history. View cutting and polishing of rough diamonds. This entry was posted in All about travel, Top attractions, What is it? 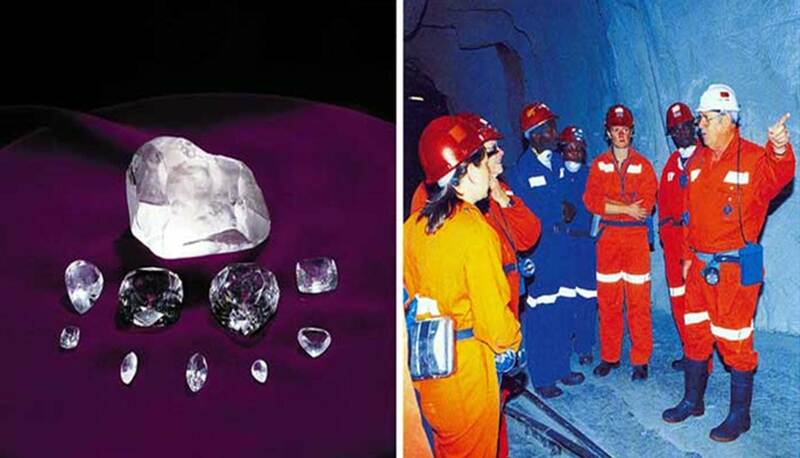 and tagged About Cullinan diamond, Adventure tours South Africa, Cullinan Diamond Mine Tours, Johannesburg activities, Largest diamond in the world, South African Adventures, South African historical tours, Underground Mine Tours by Findtripinfo.com. Bookmark the permalink. Thank you for contacting Findtripinfo.com. We are an information site only and unfortunately not a booking agent. However I would be happy to put you in touch with Cullinan Diamond Mine Tours. They can also arrange to pick you up from The Garden Court hotel and return you later in the day. Make sure you request the pickup in the quote and that you give them the name of your hotel. The above ground tour is in a vehicle but you will walk the underground tour. Underground you will wear miners protective clothing and safey gear. More info on the area from our parent site.